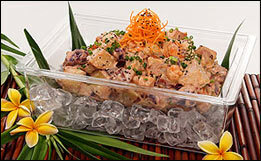 The Aloha Chill'R is the perfect practical, durable, and elegant serving dish to keep your Salsa, Guacamole, Ahi Poke, Tako Poke, Spinach Dip, Clam Dip, Fruit Salad, Seafood Salad, Pasta Salad, Potato/Macaroni Salad, Shrimp Cocktails, Cole Slaw, Marinated vegetables, and anything else you need to keep cool. 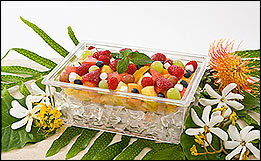 The Aloha Chill’R is made with one of the highest grade of acrylic available. Not only is it scratched resistant it also dishwasher safe, and will last for years. Introducing the Aloha Big Chill'R and the Aloha Solo Chill'R!